Bárd P, Rivet M, Vashchanka V. Final opinion on draft amendments to the act on the national council of the judiciary and certain other acts of Poland.. OSCE Office for Democratic Institutions and Human Rights; 2017. Bárd P, Sándor J. The Question of Anonymity and Privacy in Biobanking. In: Lenk C, Sándor J, Gordijn B, editors. Biobanks and Tissue Research: the public, the patient and the regulation. Dordrecht: Springer ; 2011. p. 213-30. (International library of ethics, law and technology). Sándor J, Bárd P. Anonymisation and Pseudonymisation as Means of Privacy Protection. In: Beier K, Schnorrer S, Hoppe N, Lenk C, editors. 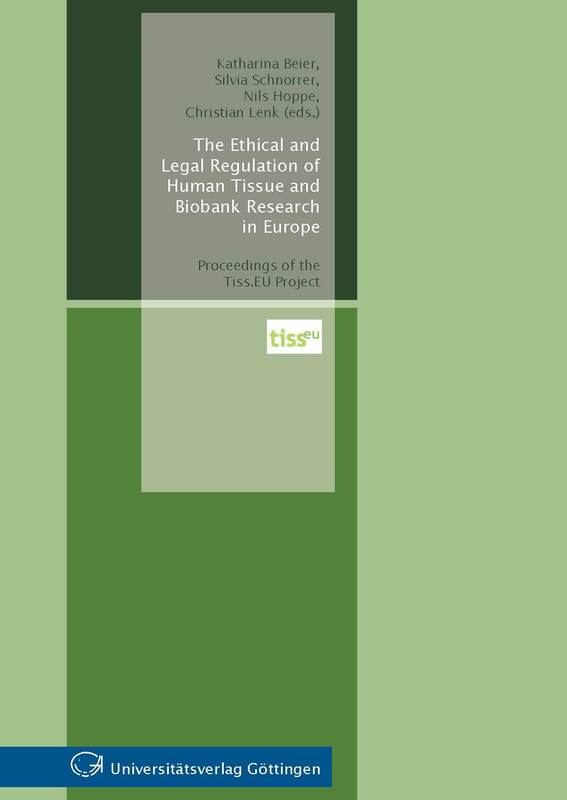 The Ethical and Legal Regulation of Human Tissue and Biobank Research in Europe. Göttingen: Universitätsverlag Göttingen; 2011. p. 25-34. Sándor J, Bárd P, Tamburrini C, Tännsjö T. Law, ethics and medicine The case of biobank with the law: between a legal and scientific fiction. Journal of Medical Ethics. 2011;38:347-50. According to estimates more than 400 biobanks currently operate across Europe. The term ‘biobank’ indicates a specific field of genetic study that has quietly developed without any significant critical reflection across European societies. Although scientists now routinely use this phrase, the wider public is still confused when the word ‘bank’ is being connected with the collection of their biological samples. There is a striking lack of knowledge of this field. In the recent Eurobarometer survey it was demonstrated that even in 2010 two-thirds of the respondents had never even heard about biobanks. The term gives the impression that a systematic collection of biological samples can constitute a ‘bank’ of considerable financial worth, where the biological samples, which are insignificant in isolation but are valuable as a collection, can be preserved, analysed and put to ‘profitable use’. By studying the practices of the numerous already existing biobanks, the authors address the following questions: to what extent does the term ‘biobank’ reflect the normative concept of using biological samples for the purposes of biomedical research? Furthermore, is it in harmony with the so far agreed legal–ethical consensus in Europe or does it deliberately pull science to the territory of a new, ambiguous commercial field? In other words, do biobanks constitute a medico-legal fiction or are they substantively different from other biomedical research protocols on human tissues? Bárd P. Rasszizmus és népirtás (maximális gyűlölet, minimális értelem). In: Kiss A, Kiss H, J. TZ, editors. Csíny vagy bűn? Budapest: CompLex; 2010. p. 83-100. Bárd P, Borbíró A. Control society uncontrolled. In: Virág G, editor. Studies in Criminology 47. Budapest: National Insistute of Criminology; 2010. p. 87-112. Bárd P, Borbíró A. Kameraláz. Adatvédelmi és kriminológiai aggályok a tömegközlekedési eszközök bekamerázása kapcsán [Camera Fever. Concerns from a Data Protection and Criminology Point of View when Placing CCTVs in Public Transportation Vehicles]. Fundamentum. 2010;3:137-49. Bárd P. The S. and Marper case. Jogesetek magyarázata (JeMa). 2010;4:70-87. Bárd P. The Force of Law: Genetic Data Protection in Central and Eastern Europe. JAHR. 2010;1(1):95-112. Sándor J, Bárd P, Schvéger J. The Legal Regulation of Biobanks - National Report: Slovenia. Budapest: CELAB; 2010. Sándor J, Bárd P. The Legal Regulation of Biobanks - National Report: Slovakia. Budapest: CELAB; 2010. Bárd P. Forensic biobanks: an effective crime prevention tool or the establishment of a surveillance society. In: Gluchman V, editor. Bioethics in Central Europe . Presov: Filozofická fakulta PU v Presove; 2009. p. 141-9. Bárd P. Genetic Databases in the Forensic Context: A European Perspective. In: Dierickx K, Borry P, editors. New Challenges for Biobanks: Ethics, Law and Governance. Antwerp: Intersentia; 2009. p. 167-80. Bárd P. You Can Leave Your Hat On: Freedom, Security and Justice: Where is the Emphasis? In: Eberhard H, Lachmayer K, Ribarov G, Thallinger G, editors. Consitutional Limits to Security . Wien: Nomos; 2009. p. 135-65. Bárd P. Helyreállító igazságszolgáltatás . In: Borbíró A, Kerezsi K, editors. A kriminálpolitika és a társadalmi bűnmegelőzés kézikönyve I. Budapest; 2009. p. 191-223. Bárd P. European Union: The Area of Freedom, Security or Jusitce? . In: Virág G, editor. Studies in Criminology. Vol 46. Budapest: National Insistute of Criminology; 2009. p. 95-114. Bárd P. Forensic genetic databases in Central and Eastern Europe. Prawa Czlowieka. 2009;12:52-80. Bárd P. A „cigánybűnözés” fogalmának értelmezhetetlenségéről [On the Incomprehensibleness of Roma Criminality]. Rendészeti Szemle. 2009;57(12):18-33. Bárd P, Pongrácz K. A teratogén gyógyszermellékhatásról való tájékoztatás elmulasztása [Failure to Inform the Patient about the Teratogenic Side-Effects of the Prescribed Drug]. LAM (Lege Artis Medicinæ) . 2009;19(06-07):449-53. Bárd P. Boj proti terorizmu: Evropski standardi varstva osebnih podatkov in vzpostavitev druzbe nadzora [The fight against terrorism: European data protection standards and the establishment of a surveillance society]. 11 Pravna Praksa . 2009;March:13-4. Sándor J, Bárd P. The Legal Regulation of Biobanks - National Report: Hungary. Budapest: CELAB; 2009. Sándor J, Bárd P. The Legal Regulation of Biobanks - National Report: Latvia. Budapest: CELAB; 2009. Sándor J, Bárd P. The legal regulation of biobanks : national report : Cyprus. Budapest: CELAB; 2009. Sándor J, Bárd P. The legal regulation of biobanks : national report : Estonia. Budapest: CELAB; 2009. Sándor J, Demény E, Bárd P. The legal regulation of biobanks : national report : Romania. Budapest: CELAB; 2009. Sándor J, Demény E, Bárd P. The Legal Regulation of Biobanks - National Report: Lithuania. Budapest: CELAB; 2009. Sándor J, Drakopoulou A, Bárd P. The Legal Regulation of Biobanks - National Report: Greece. Budapest: CELAB; 2009. Sándor J, Mauro C, Bárd P. The legal regulation of biobanks : national report : Italy. Budapest: CELAB; 2009. Sándor J, Schvéger J, Bárd P. The legal regulation of biobanks : national report : Malta. Budapest: CELAB; 2009. Sándor J, Sliwka M, Bárd P. The legal regulation of biobanks : national report : Poland. Budapest: CELAB; 2009. Bárd P. A fogyatékkal élő személyek jogai: Tolerancia a társadalmi szerződésben. In: Bertók R, Barcsi T, Bécsi Z, editors. Tolerancia?! Kirekesztés – megtűrés – befogadás . Pécs: Ethos; 2008. p. 64-72. Bárd P. A kölcsönös bizalom elvével szembeni alkotmányos aggályok az európai elfogatóparancs példáján keresztül. In: Virág G, editor. Kriminológiai Tanulmányok. Vol 45. Budapest: National Insistute of Criminology; 2008. p. 175-92. Bárd P. A társadalompolitikai paradigma vesztesei. Gondolatok az értelmi fogyatékkal élő személyek jogairól [The Loosers of the Social Model. Thoughts on the Rights of Persons Living with Mental Disabilities]. In: Értelmi Fogyatékossággal Élők és Segítőik Országos Érdekvédelmi Szövetsége: Az értelmi fogyatékossággal élők helyzetének jogi aspektusa és az új Polgári Törvénykönyv tervezete. Budapest: ÉFOESZ; 2008. p. 84-98. Bárd P. Mutual diffidence against the principle of a "high level of confidence" in the Third Pillar. In: Dieringer J, Müller MM, editors. Freiheitsrechte in der Europäischen Union. Opladen: Verlag Barbara Budrich; 2008. in print. Bárd P. The principle of availability and the exchange of DNA profiles among Member States: the development of forensic sciences or that of a European Panopticon. Ügyészek Lapja [Prosecutors' Journal]. 2008;Különszám [Special Edition]:99-108. Bárd P. Egy jogintézmény hányatott sorsa: az európai elfogatóparancs [The Rugged Fate of a Legal Institution: The European Arrest Warrant]. Rendészeti Szemle. 2008;12:3-26. Bárd P. A prümi szerződés: csapdahelyzet [The Prüm Treaty: A Pitfall]. Rendészeti Szemle. 2007;10:86-91. Bárd P, Ligeti M. Megjegyzések a büntetőjogi kodifikáció előkészületeihez [Comments on the Preparations of Criminal Codification]. Ügyészek Lapja [Prosecutors' Journal]. 2007;2:61-4. Bárd P. Európai alkotmányozás és az uniós polgárság [European Constitution-Making and Union Citizenship]. In: Hegedűs I, editor. A magyarok bemenetele (Tagállamként a bővülő Európai Unióban) [Hungary Marching In (As a Member State in the Enlarging European Union)]. Budapest: DKMKKA; 2006. p. 333-54. Bárd P. Beszámoló a Jogállamiság és a terrorizmus elleni harc című nemzetközi konferenciáról [Summary on the international conference on “The Fight Against Terrorism and the Rule of Law”]. Ügyészek Lapja [Prosecutors' Journal]. 2006;6:79-81. Bárd P. A fogyatékkal élő személyek jogai az acquis communautaire tükrében [The Rights of Disabled Persons in Light of the Acquis Communautaire]. Fundamentum. 2006;4:103-14. Bárd P. The Regulation of the Rights of Persons with Disabilities in the European Union. Fifth Workshop for Young Scholars WISH, Les Travaux du CERIC. 2006:in print. Bárd P, Antal S. Beszámoló a Társadalmi összefogással a lakásmaffia ellen című tanulmánykötet könyvbemutatójáról [Summary on the book presentation on Joint Social Efforts Against the Apartment Mafia]. Ügyészek Lapja [Prosecutors' Journal]. 2006;5:63-4. Bárd P. The German Anti-Discrimination Legislation with a Special Focus on Disability. Acta Juridica Hungarica . 2006;47(3):273-301. Bárd P. "Ne parázz!" Gondolatok a fogyatékosságról a sérült emberek világát bemutató gyermekkönyv kapcsán . Család, gyermek, ifjúság. 2006;15(4):20-6. Varga Lívia Éva gyógypedagógus, Bánki László gyermekpszichológus, és Csató Gyula szociális munkás „Ne Parázz!” címû könyve 9-14 éveseknek mutatja be a sérült emberek mindennapjait, és ad iránymutatást, hogy hogyan segíthetnek a fogyatékkal élôknek.1 A gyermekeknek szóló mesékben a felnôttek, gyerekek, és más lények belsô tulajdonságai is megjósolhatók bizonyos külsô jegyek alapján. Ezekkel válnak beazonosíthatóvá bizonyos belsô, negatív tulajdonságok. Végre egy gyerekkönyv, amely szakít e hagyománnyal. Bárd P. Az alapjogok helyzete Magyarországon 2005-ben [Progress Report on the Situation of Fundamental Rights in Hungary in 2004]. Fundamentum. 2006;1:163-81. Bárd P. Az alapjogok helyzete Magyarországon 2005-ben. Fundamentum. 2006;1:163-81. Bárd P. Gondolatok a fogyatékosságról [Thoughts on Disability]. Ügyészek Lapja [Public Prosecutors’ Journal]. 2006;3:53-60. Bárd P. Az elveszett alkotmány? – Az európai alkotmány főbb jellegzetességei és alkotmányjogi összefüggései [Constitution lost? – The main characteristics and constitutional aspects of the European Constitution]. Beszélő. 2005;6-7:65-72. Bárd P. Az alapjogok helyzete Magyarországon 2004-ben [Progress Report on the Situation of Fundamental Rights in Hungary in 2004]. Fundamentum. 2005;2:139-54. Bárd P. Hungarian Constitutional Court Decision on Euthanasia -- A Half-Hearted Ruling: Case Study of the Decision No. 22/2003 (IV. 28.) of the Hungarian Constitutional Court. Revue of Constitutional Justice in Eastern Europe. 2004;4:105-20. Bárd P. A születő európai alkotmány [European Constitution in the Making]. Acta Facultatis Politico-Iuridicae Universitatis Scientiarum Budapestinensis de Rolando Eötvös Nominatae TOMUS XL-XLI. 2004:255-70. Bárd P. Az alapjogok helyzete Magyarországon 2004-ben [Progress Report on the Situation of Fundamental Rights in Hungary]. Fundamentum. 2004;1:177-204. Bárd P. Report on the Conference on the Turkish Welfare Party Case Held at the Central European University, Budapest. International Journal of Civil Society Law. 2003;1(3):207-9.